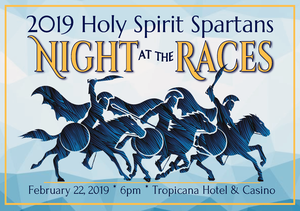 2019 Holy Spirit Spartans - Night at the Races! Come enjoy exciting races, fabulous auctions, great music by Kenny I. Entertainment and delicious food while supporting a great cause on February 22nd! Join us Friday, February 22, 2019 for our Inaugural HSHS Spartans Night at the Races! This event replaces the Bash & Hall of Fame Award night as the major fundraising event of the school year. Holy Spirit will induct and celebrate Hall of Fame inductees every 3 years. Due to the predicted snowfall there will be no school today, Wednesday, February 20, 2019. All after school and evening activities are cancelled as well. Enjoy the day and please stay safe.